Service dogs are trained to assist disabled individuals, so they may lead more independent lives. The work they do to serve people with disabilities, is truly remarkable. These working dogs actually become an extension of their owners. They bring into their owner's lives a sense of security, freedom, independence, as well as companionship. The U.S. Codes of Federal Regulation for the Americans with Disabilities Act of 1990 defines a service animal as "any guide dog, signal dog, or other animal individually trained to do work or perform tasks for the benefit of an individual with a disability, including, but not limited to, guiding individuals with impaired vision, alerting individuals with impaired hearing to intruders or sounds, providing minimal protection or rescue work, pulling a wheelchair, or fetching dropped items." The dogs selected for this type of service training must be of good temperament and health, have strong physical structure, and be easily trainable. 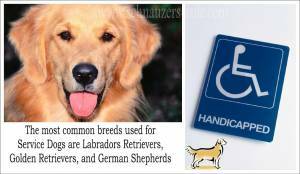 This makes the Golden Retriever, Labrador Retriever, and German Shepherd some of the favorite dog breeds to use for Service dogs. The Miniature Schnauzer, although possessing all these characteristics, are usually too small in stature. Their cousins however, the Giant Schnauzer and the Standard Schnauzer, can make good Assistance dogs. 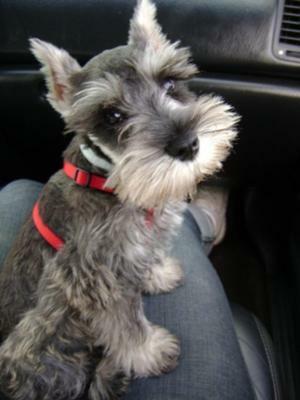 Miniature Schnauzers DO, however, make wonderful Therapy Dogs. Under the Americans with Disabilities Act (ADA), businesses and organizations that serve the public must allow people with disabilities to bring their assisting animals into all areas of the facility where customers are normally allowed to go. This federal law applies to all businesses open to the public, including restaurants, hotels, grocery and department stores, hospitals and medical offices, theaters, health clubs, parks, zoos, and all public forms of transportation - taxis, shuttles, trains, subways, buses, planes…. These special animals are trained to do a variety of tasks, according to the needs of the disabled person. They may learn how to: retrieve things that drop, get items from hard-to-reach places, open doors (including the one to the refrigerator), push elevator buttons, turn light switches on and off, carry items in their mouths or backpacks, pull wheelchairs, alert owner to the sounds of the telephone, oven timers, alarm clocks, smoke alarms, a baby's cry and go get help should their partner need human assistance. For example, a Seeing Eye dog or Guide dog is trained to guide the blind and vision impaired around obstacles so they can navigate the world in which we live without the assistance of another human being. These dogs are basically the eyes for their owners. The training for Guide Dogs is intense and demanding. Just imagine how much training is needed for a dog to learn to navigate streets, stairs, and all kinds of obstacles that could pose a possible threat for their owner. And they must be able to ignore all kinds of distractions while doing so. Amazing! Other types of Service Dogs include: Autism dogs, Hearing dogs, Mobility assistance dogs, Seizure alert dogs, and Medical response dogs, just to name a few. Assistance Dogs Supplies Most dogs begin their training as puppies. For the first 6 months to a year they are raised by volunteer foster families who train them in basic dog obedience and socialization. A strong emphasis is placed on socialization and good manners - Canine Good Citizen, as this is crucial to the success as a Service dog. The dogs are then returned to complete their formal training which takes an additional 6 months to a year. Dogs are evaluated for temperament and intelligence before allowing them to enter a formal training program to learn the additional and specific skills of the individual it will be partnered with in the end. Service dogs usually continue their work until the dog is between 8 to 10 years old. During their working years, assistance dogs still receive regular physical exercise and mental stimulation that every dog needs when they are not on-duty or in-gear. Once a dog retires, the current owner he is partnered with is usually allowed the option of keeping the dog as a pet. If the owner is unable to care for the dog in that way, the dog is returned to the program from re-homing. At this point, the original foster family that raised the dog as a puppy is given first opportunity to keep the dog as a family pet. If that is not an option, the pet is adopted out to a selected home carefully screened for adoption. note: When you see a dog wearing a service vest or patch , it is important to remember that this is a working dog. The health and safety of their owner is dependent upon the dog's ability to focus and resist distraction. Do not speak to the service dog or touch him without first receiving permission from the owner. "Knowledge Share"... If you found this page on Service Dogs helpful and informative, please share it with your dog-loving friends by clicking on one of the share links (like facebook, twitter, and google +1) located at the top right or bottom of this page.